The filing doesn’t mention more personal data such as messages, documents, photos, and contacts that are often saved on Apple’s iCloud service. However, it does say that Apple stores more information about its Russian employees in the country. Details include: workers’ Russian passport numbers along with place and time of issuance; permanent and temporary addresses; history of work evaluations; and information about income, according to the filing. Apple agreed to put some information into a server warehouse in Russia that’s operated by IXcellerate, Russian publication Kommersant reported in 2015. But Russia has enforced its rules aggressively. In 2017, the country’s communications watchdog Roskomnadzor said it would shut down Facebook Inc. if the social-media company didn’t comply. The regulator also ordered Russian telecom carriers to block access to LinkedIn Corp. in 2016, citing non-compliance with the law. Google stored some data in the country when the law kicked in. The move to store some data locally wouldn’t be the first time Apple has agreed to the requests of the Russian government. Last year, Apple stopped publishing updates of the Telegram messaging service for about two months after the government asked Apple to pull the app from its App Store, according to Telegram’s founder. Apple did not remove the app, though. Russia isn’t one of Apple’s major markets, but the iPhone maker has steadily increased its presence in the region. The company launched a version of its online store in Russia in 2013 after opening up the iTunes Store there the previous year. It doesn’t have a retail store in the country. 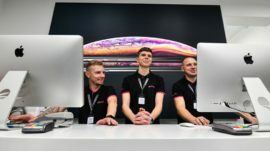 Apple was the third-largest smartphone maker in Russia in the second quarter last year, behind Samsung Electronics Co. and Huawei Technologies Co., according to Counterpoint Research.